He’s played and recorded with Frank Sinatra, Barbra Streisand, Ray Charles, the Beach Boys, Elton John, Dolly Parton and Barry White. 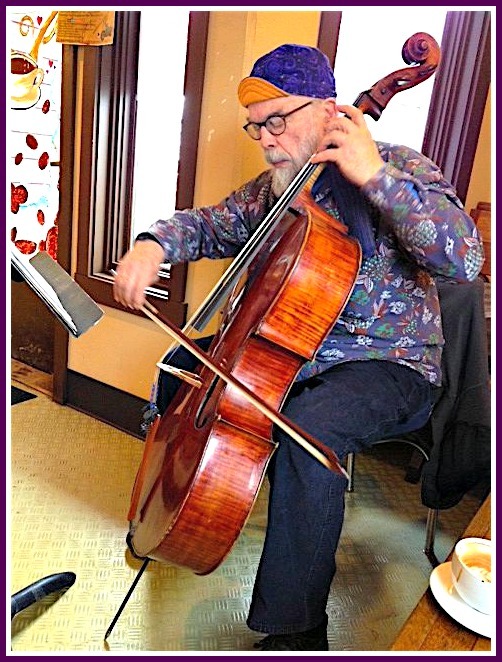 He hung out with Pablo Casals — in Westport. He’s 81 years old. He lives a continent away, near Seattle. In fact, Buell Neidlinger hasn’t been back here much since he left in 1955. But he’s an avid “06880” fan. He comments frequently, primarily on music and looking-back stories. And man, does he have tales to tell. Buell arrived in Westport in 1938, at 2 years old. His parents rented a house on South Compo Road. (A few years later, his father worked with General Eisenhower’s staff in London, planning the Omaha Beach landing.) Buell’s grandfather lived nearby, on Thomas Road. Buell went to Bedford Junior High, then St. Luke’s in New Canaan. 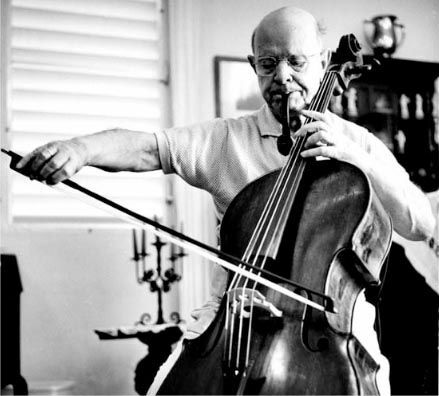 Pablo Casals was one of the first famous musicians Buell Neidlinger met. He would not be the last. His first instrument was the cello. That led to his early encounter with Casals. The bass came later. He spent one year at Yale. The McCarthy hearings mesmerized the country. Buell realized, “I was in school with the same type of people I was watching every day on TV.” College was not for him. Buell floated around. He returned to Westport, working in Frank Zack’s “high-class haberdashery” downtown. He sold aluminum windows. Meanwhile he practiced bass in a warehouse, playing along to records. Max Kaminsky, a famous jazz trumpeter renting in Westport, convinced Buell to move to New York — perhaps the best advice he ever got. He backed Billie Holiday when she played clubs, during the last years of her life. The custom of the day was for the rhythm track to be recorded first. Then came vocals, followed by horns. The “string sweetener” — with Buell — came last. The lead vocalist cut another track, this time singing along with the strings. Buell’s studio work led to a number of live gigs. He played with Chuck Berry, whose promoter was the first white man Buell ever saw with long hair. The Moody Blues flew Buell to London. They needed his acoustic bass. It wasn’t all rock, pop and jazz. Buell also played with the father of bluegrass, Bill Monroe. The list of famous recording sessions rolls off Buell’s tongue: The Village People’s “YMCA.” The Eagles’ “Hotel California” and “Desperado.” He played with the 5th Dimension and Chicago. He was there the night John Lennon challenged Harry Nilsson to the screaming match that ruined Harry’s voice. 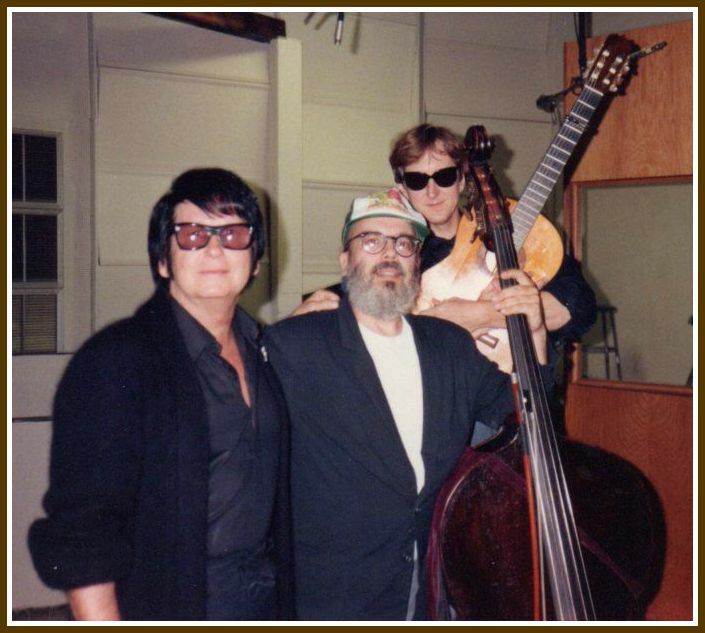 Buell Neidlinger (center), flanked by Roy Orbison and T Bone Burnett. He met Whitney Houston when she was just 9 or 10. Her mother — famed gospel singer Cissy Houston — brought her to sessions. During breaks, Cissy and other backup singers sang church songs to their kids. “I’ve never heard anything like that,” Buell recalls. Elton John played piano on his first 3 albums, while Buell played bass. Years later, Elton offered him $10,000 to perform in a Hollywood concert that included Leon Russell (whom Buell had backed on earlier club dates). Buell was honored — but had retired. He’d gotten other calls too, like the one to play with Frank Sinatra in Egypt, for King Farouk’s birthday. Among all the singers Buell backed, Barbra Streisand stands out. During one session, he played a Mozart composition. She did not like one note. “She changed Mozart,” Buell marvels. 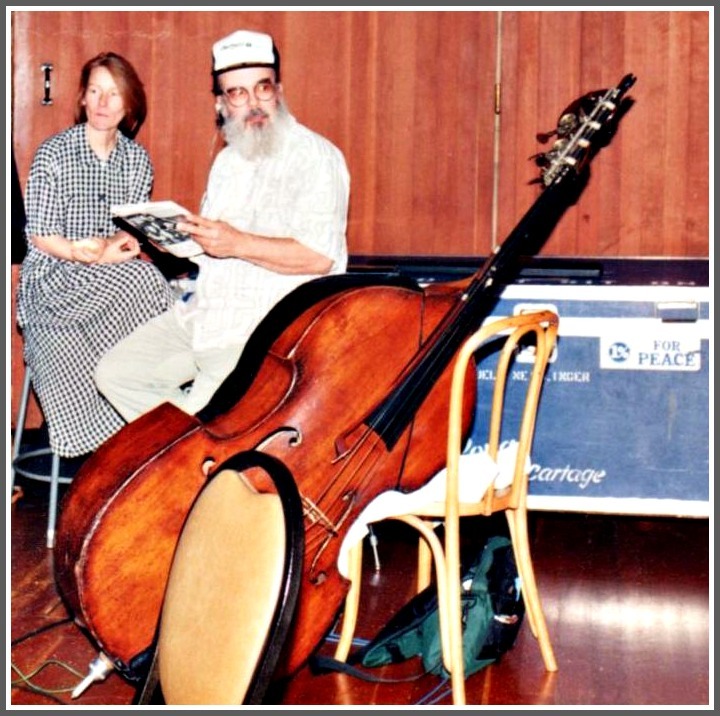 Buell Neidlinger and his wife, Margaret Storer, on the Warner Brothers sound stage in 1993. The big blue trunk carried his 1785 Italian bass. Film recording has changed a lot, Buell notes. When he began, musicians worked up to 8 hours a day, for 10 days. For “La La Land,” he says, the orchestra played for just 4 hours, once. All the rest was done on computers. In 1992, Buell and his wife, Margaret Storer, took their very first vacation: to Whidbey Island in Puget Sound. They liked it so much, they bought property there. That’s where they live now. In retirement, he plays cello all day. Of course he did. He’s Buell Neidlinger. The only man from Westport who has played with Pablo Casals, Brian Wilson, Duane Eddy. This entry was posted in Arts, Entertainment, Looking back, People and tagged Barbra Streisand, Buell Neidlinger, Dolly Parton, Frank Sinatra. Bookmark the permalink. Jazz and bluegrass nerds should seek out the album LOCOMOTIVE by Buell Neidlinger’s String Jazz ensemble. Monk and Ellington compositions swinging like mad. My son, who lives in Nashville, suggested that I would enjoy Dan Woog’s 06880 blog – I had never looked at a blog before. The very first posting I read included a comment from Buell – amazing, I had rarely thought of him in many years but had never forgotten him and our lovely summer before he went off to Yale and I began my senior year at Bolton School (GFA). In my comment that day I briefly recounted a little bit about some fun teenage goings-on and how we drifted apart when he went off to New Haven. But it turns out, after all, that Buell had more impact on my life than either he or I knew. Growing up, going to an all girl school, as a teenager I knew very little about boys & men – mainly, my exposure was to family: my father, smart, pragmatic, loving but tough; my brother, low-key, a brilliant problem solver, kind, and faithful. We were very close: someone once said of the two of us “One would lie and the other would swear to it.” So when it came to boys and men I was pretty clueless…. I really expected all of them to be like the boy and man I knew. Buell, my first real boyfriend, spoiled me forever. With his brilliant mind, sensitivity and gentle nature he showed me a depth of kindness which I totally took for granted – I was only 17. Looking back now I see that I thoughtlessly assumed that “that’s how men are.” You can imagine the trouble that got me into for the rest of my life. So, I’m really glad to see Dan’s celebration of Buell here, of his wonderful success as a musician, how he has brought joy and understanding to people throughout his career. I’m not at all surprised, although I had no idea of all he has accomplished. After that first blog comment Dan kindly gave Buell my phone number and the two of us had a great conversation over 3000 miles, catching up. And, I was happy to realize that this very special man had been a part of my life. A lot of names in that story – and for good reason. Buell was simply one of the best bassists around. 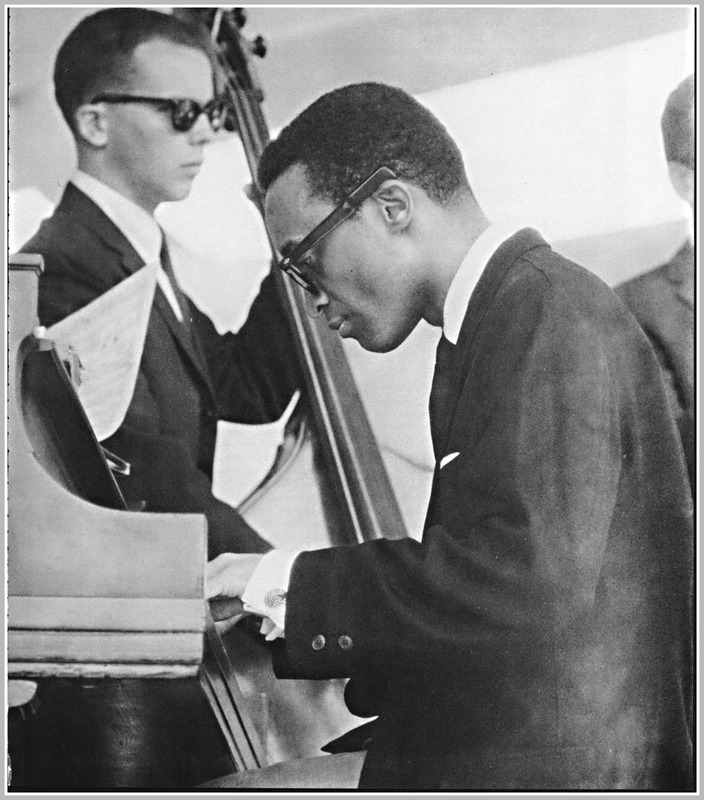 We were friends in the 1950s when he was a jazz player and I was impressed at how perfectly he could hit every note. Most jazz bassists, even the well known names, are quite sloppy in their intonation, playing notes that are off-key or sounding like quarter tones. Not Buell – he was just about the only bass player I could listen to. And there was also Buell the Sailor. We were both at the Compo Beach harbor a lot and his family owned a wonderful gaff-rigged sloop named PINAFORE which I took a fairly famous photo of. Buell says the boat was designed by Nathaniel Herreshoff, tho his father only claimed it was a Herreshoff type. So Buell and I are into boats and we favor classy traditional ones. We keep in touch, having found each other on 06880. At Staples, my older brother, Chuck Wandres (Staples, 1946???) played in the school band, and was a good enough clarinetist to once be invited to sit in for a very late night set at Eddy Condon’s, the jazz place in New York City, when West 52nd street was the City’s jazz center. I had just turned 17 in 1952 when Chuck invited me to drive into the city on one of those sessions, and park myself with a Coke in a dark corner of Condon’s. There, Holy Cow! was Buell Neidlinger up with Condon and his band. My thanks to Dan Woog for helping all of us “Stapleites” (is that correct?) keep in touch with our tribe. Another great profile! Thank you Dan! So interesting … what a life (I’m a little bit envious, tee hee). Ah, Whidbey Island, a true artist’s haven much like Saltspring to the north. I realize I’m a few days after this article was published, but does anyone have more specific information on Pablo Casals’ time in Westport? After that first blog comment Dan kindly gave Buell my phone number and the two of us had a great conversation over 3000 miles, catching up.